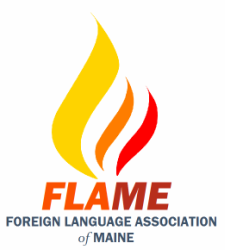 Click below to donate to our FLAME Scholarship Fund! Thank you so much! ​1) Complete this Google form to register and an invoice will be sent to the email address you provide. 2) Print and mail a copy of that invoice with your payment if mailing a check. 1) Print this form, fill it out and make a copy for yourself. Mail it via snail mail along with your check. Please be aware that it will take two weeks or more to process paper forms. Your registration is not complete until both form and payment have been received. Use the buttons above as needed. We add $1 per payment to cover PayPal fees. ​Submit a copy of the invoice you received via email to your district's central office, requesting payment be sent. Mail a copy of your completed form, along with payment, to the address on the form: FLAME, PO Box 207, Augusta, ME 04332. ​Informational emails with job postings, teacher tips, local events, etc.